This organization operates under a “doing business as” name. The legal name of this organization is Institute for Public Affairs. 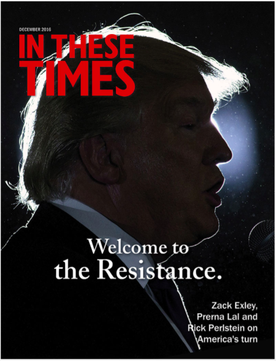 In These Times is a socialist magazine and online news and opinion website founded in 1976 by James Weinstein. The magazine has long been an influential publication in far-left socialist circles and is recommended by the Democratic Socialists of America as a publication to read for a socialist reading group. The publication states that it reaches over 350,000 readers monthly via its various streams. Many influential far-left figures have been involved with the publication since its founding including Kurt Vonnegut and Noam Chomsky. The operating organization is a 501(c)(3) non-profit called the Institute for Public Affairs which does business as In these Times. In These Times was founded in 1976 by James Weinstein, a lifelong socialist and former member of the American Communist Party who worked for or founded socialist publications, including Studies on the Left and Socialist Review. Weinstein had left the Communist Party in 1956 and eventually gave up on third-party political activity and advocated for socialists to work within the confines of the Democratic Party. Weinstein modeled In These Times after the early 20th century socialist newspaper Appeal To Reason which was published in Kansas from 1895 to 1922 and featured prominent socialists of the time including Socialist Party Presidential candidate Eugene V. Debs and labor union activist (and Mother Jones magazine namesake) Mother Jones. Throughout its history In These Times has published most of the influential socialist and other left-wing writers of the era including Noam Chomsky, and Kurt Vonnegut, who served as a senior editor for the publication. The current editor and publisher of In These Times is Joel Bleifuss, who has worked at the magazine since 1986. Their website further states that its Working In These Times blog is funded by a grant by the Public Welfare Foundation, a left-wing grantmaking foundation. In These Times has been closely aligned with labor unions since its founding and currently runs a pro-labor union blog titles Working In These Times which supports pro-union employment policies and spews anti-business rhetoric. The magazine published many articles lambasting the U.S. Supreme Court decision in Janus v. AFSCME which protected the rights of employees who reject the union agenda but are forced to be represented by government worker unions including AFSCME, which is a sponsor of In These Times. In February 2014, the staff of In These Times voted to unionize and joined the Communication Workers of America union. Staff statements said they had unionized to align with the pro-union stances of the publication and to protest frequent layoffs and rehires by the publication due to inconsistent funding streams. Fletcher jr., Bill. “The Janus Decision Was Never About the First Amendment. It Was About Destroying Labor.” Working In These Times. June 27, 2018. Accessed July 8, 2018.